Paul Day’s gigantic and appallingly twee statue ‘The Kiss’ (probably a bad idea to invoke a comparison to Rodin) has had enough exposure without me putting another shot of it on this site. It’s been described as ‘an Athena poster come to life’ and ‘a three dimensional H&M sale window’, both of which pretty much nail this arrogant bit of tat featuring the artist and his wife. But what’s even worse, the base (the only bit you can see at human level) is now filled with a diorama of breathtaking ugliness. Mere photos cannot convey the full horror of the addition, but I’ll try. First there’s the disembodied nose. 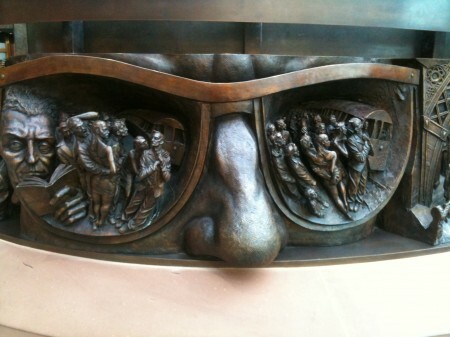 Inside the glasses, the original design, which evoked some kind of rail disaster, has been toned down to present rail travel as a vision of hell. In another panel, the classical idea of love is represented by a bloke avoiding a woman’s gaze while she reads her text messages. Further around, the daily commute to work is represented by a Night Of The Living Dead-style zombie invasion. This vertiginous view of the misery of human existence adopts a ‘Cabinet Of Dr Caligari’ vibe to invoke the horrors of the industrial revolution. 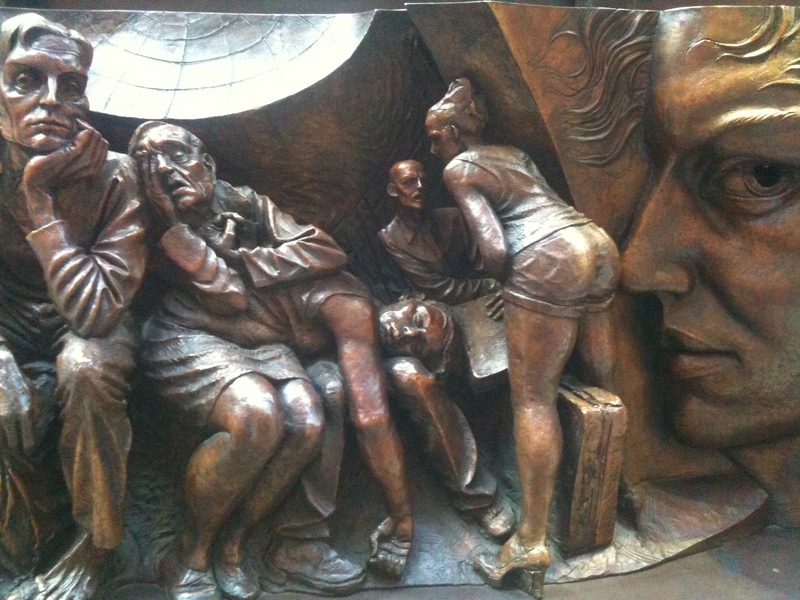 There are many more such panels of concentration-camp commuter nightmares, and they’re peppered with little bits of old school sexism, with legs-akimbo girls thrusting their bottoms at the public. This bit, with a man sniffing the woman’s arse, is probably the worst. It’s worth briefly visiting ‘The Kiss’ just to see the look of horror on passing visitors’ faces. 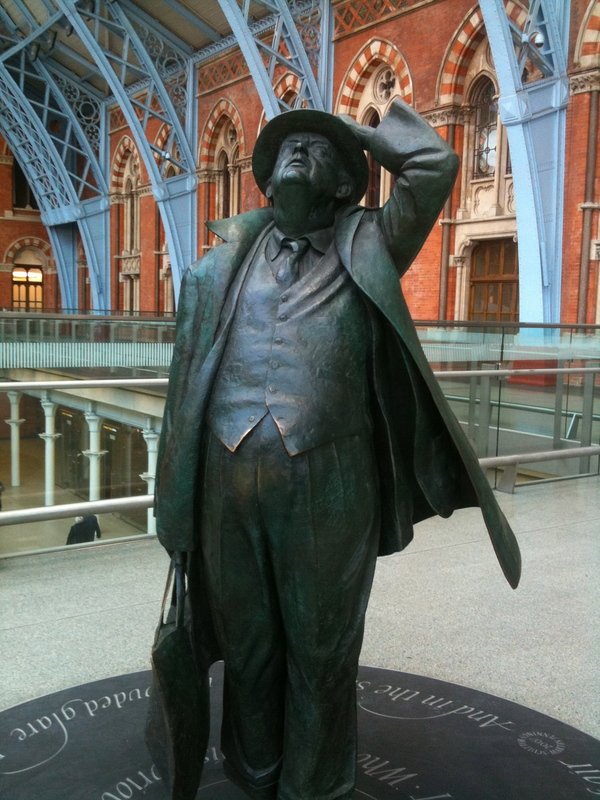 Meanwhile, just across from this grotesque bronze car-crash of adolescent heavy-metal imagery, people are taking pictures of the actual hero of the station, the man who saved it from the wrecker’s ball, Sir John Betjeman, represented in a delightfully affectionate human-scale statue by Martin Jennings. It’s modest and gentle, and perfectly captures the Poet Laureate’s nature. Wonderful close-ups. Enjoyed your “commentary track” and the pictures themselves, I’ll try & check out those weird attempts at grandiosity next time I’m lucky enough to come to London! Aye I’m down in a few weeks, and the post doesn’t so much warn me off as intrigue me enough to seek it out. I shall no longer lament the lack of culture in Queensland. 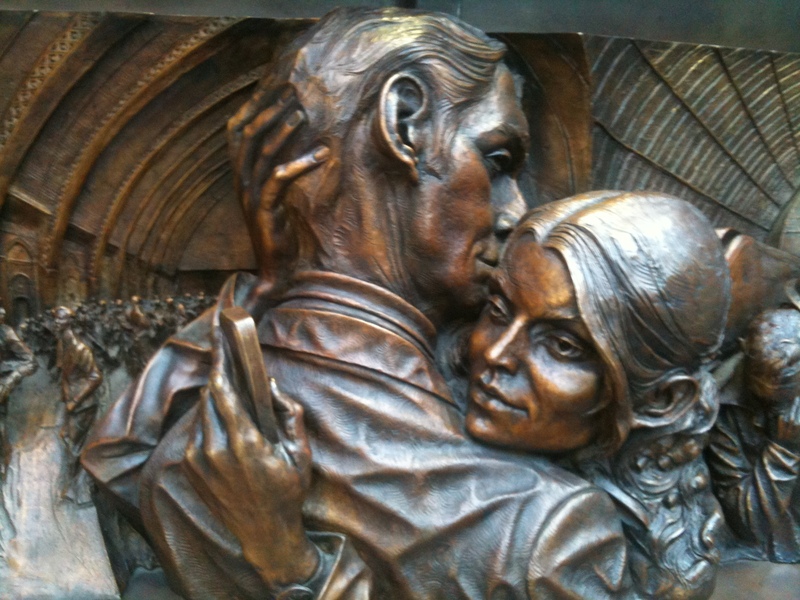 Mind you, the man avoiding the girl’s gaze could be John May. Look at the base of the Betjeman statue and note the truly lovely calligraphy. At least, what I can see of it is lovely. Etched or carved in slate? 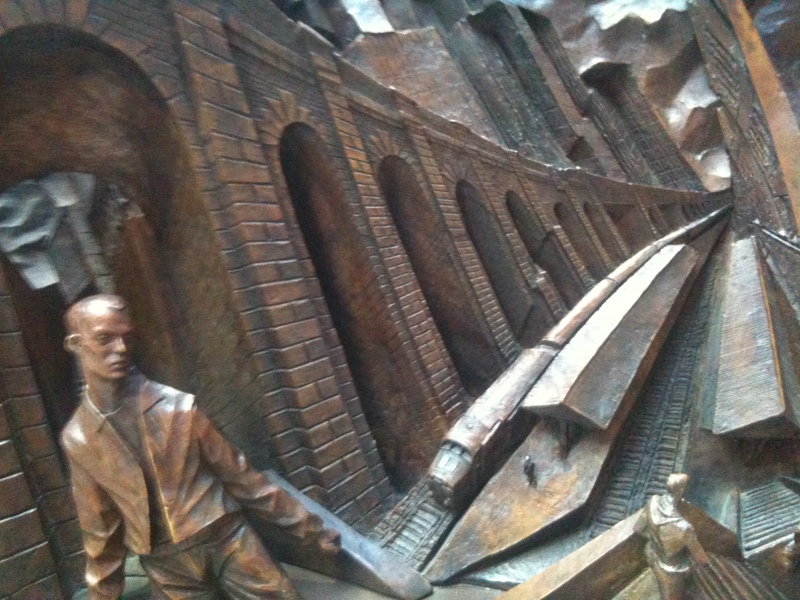 To answer my own question: magnificently carved into Cumbrian slate. There is something very human about this statue. The Kiss, however is just pretentious. 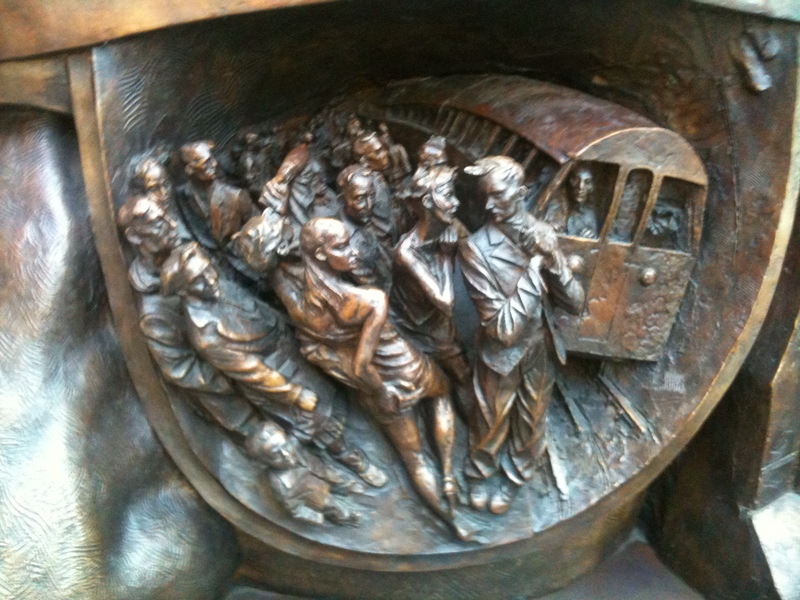 And you should look at Mr. Day’s panel showing scenes from the Queen Mum’s life. The only way you know it’s her is the hat and the pearls – and the corgi in the far side of the panel. 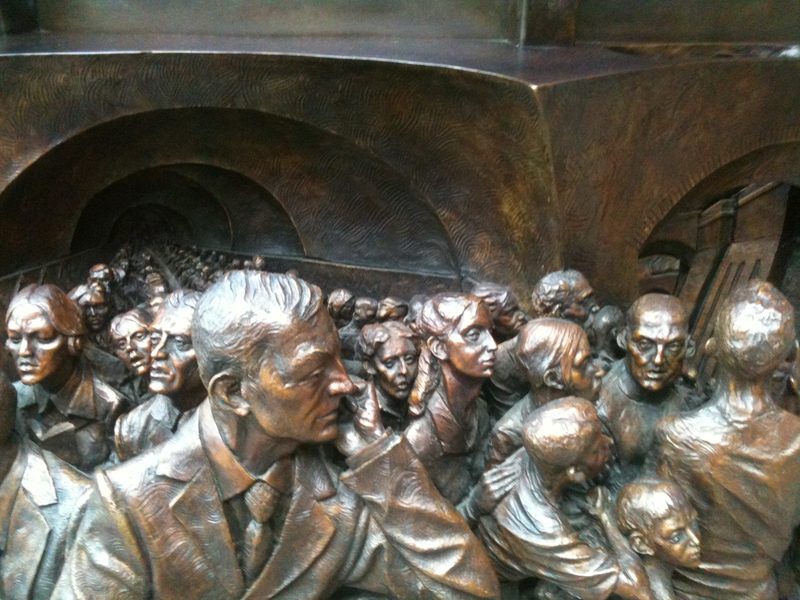 George VI looks like himself but he hasn’t got her face right at all.